Wow, this was a hard one to research. Unlike reality stars or sports personalities, Artists, especially visual artists, tend to not have a broad-reaching list of things they are currently doing. Fab Five Freddy is a man that straddles the world, bridges genres and was integral to the proliferation of Hip-hop culture across the globe. He was the face of MTV’s first hip-hop channel, which took a frankly embarrassing length time to appear on the channel, was a contemporary of Andy Warhol and was uniquely positioned to chronicle the birth of a movement. So let’s see what he is up to these days. An easy question to answer, but a hard one to get specifics on. Freddy is a visual artist, with a foot in the old school world of graffiti and the remix culture of Hip Hop. So far as I can tell his most recent exhibit was in the middle of last year, showcasing a late seventies subject matter with a post-modern aesthetic. It combined Kung Fu, Hip Hop, and Blaxploitation, snap shooting the late seventies era, highlighting not only a period of heroes for urban youth but meshing it with the iterative nature of modern art, not only visual art but music as well. The exhibit also featured MC Yans, who was more able to latch onto the Asian aspect of the subject matter. I wasn’t able to view the entire collection, but what I saw was impressive, and well worth looking up. He worked with Google last August for their Google Doodle, this one commemorating what some call “The Birth of Hip Hop”, back in 1973 when DJ Kool Herc pioneered the Break. He introduced the concept for that day’s Doodle, a working turntable. I played around with it for around a half hour, super fun. I’ll leave a link for it at the bottom of the page. Fab 5 Freddy also appears in TV shows and movies. His most recent appearance was in She’s Gotta Have it, but if you pay attention in the final episode of Luke Cage you can see him before the fight scene. He is more active in documentaries. I have mentioned this before, but I am very much looking forward to Living in Stereo: The Story of MTV here’s hoping they don’t pull any punches. A look through his IMDB reveals a whole host of appearances, which is far from surprising, he has been a key figure in the art world for thirty years now and has a valuable insight in that world. Expect to see more documentaries, a few more acting appearances, and of course, art exhibits all over the world from Fab 5 Freddy. 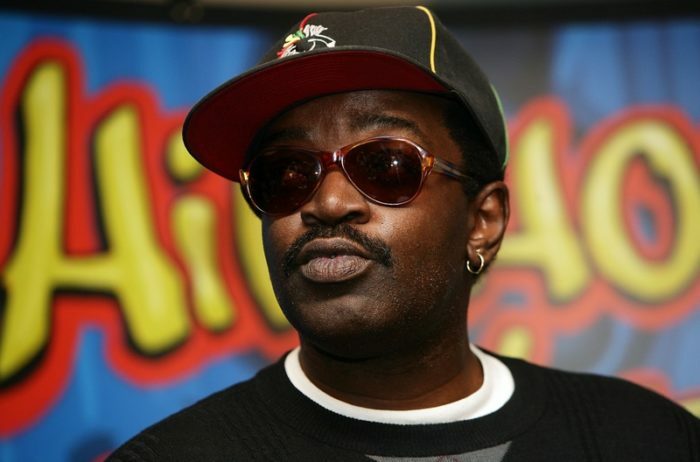 Fred Brathwaite, better known as Fab 5 Freddy, was born on August 31, 1959, in New York City. In the late seventies, he was a member of the Brooklyn, New York graffiti group the Fabulous 5, where he got his nickname. He was also known for his graffiti art of the number 5 train on the IRT. Under the direction of contemporary graffiti artist Lee Quiñones, the pair began to move into the art scene in general. By 1979 the pair were exhibiting in Rome, in the Galleria LaMedusa no less. 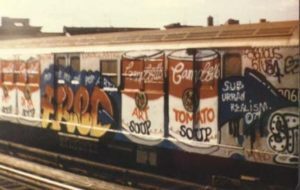 In 1980 he painted the side of a subway car with an iteration of Andy Warhol’s Campbell Soup, you can see a pic of it there on the right. In 1981 he curated the Futura 2000 art show, featuring not only his own art but the likes of Jean-Michel Basquiat and Rammellzee. It was this show that allowed him to step into an odd role in the scene, that of the go-between. The bridge between the art world and the more underground world of street art. In 1982 he released the single “Change the Beat”, which is quite possibly the most sample track from the era. The song is a wonder little fact, a literal representation of the symbolic influence he had on the culture at the time. In the late eighties, he helped Hip-Hop hit a worldwide audience as the host of Yo! MTV Raps. 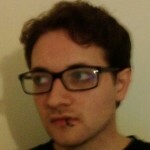 There is so much to this guys career that I am barely scratching the surface of even his early days with this article. if any of this interests you then please look into it in more detail. Fab 5 Freddy’s life intersects so many seminal moments of the last 30 years in the art world and the music business. Pity he hasn’t released an autobiography.